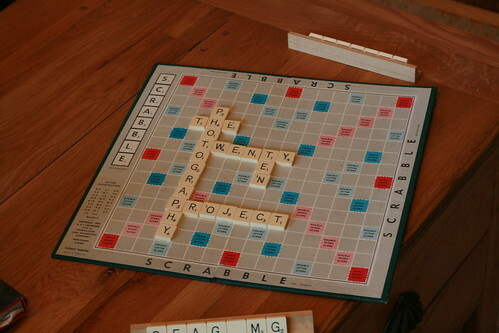 The Twenty Twelve Photography project is still underway, and can be followed on flickr. The uploaded files are lagging behind a bit, but so far I have only forgotten a day, and even then I remembered only 53 minutes too late. The photo here is fairly atypical, with the collection being of more interest than the photo itself. I’ve tried to gather together as much storage as I could, although stopped short of sticking an entire spindle or two of DVDs on the desk. Similarly the total storage capacity is based on advertised capacity, and thus ignores issues such as formatted capacity and differences between kilobytes and kibibytes. The floppy disk is there more for show than anything else, I don’t even own a floppy drive. While the diversity of formats and capacities is interesting in its way, what is more surprising is how many of them are redundant. 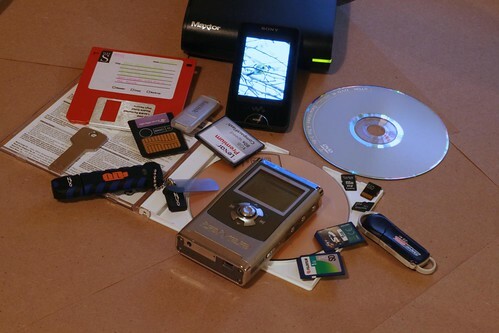 The iamakey performs the role previously taken by a hoard of floppy discs, and even the blank CDs and DVDs rarely get used on a day to day basis. Indeed, formats and devices has become the determining factor in how many bits of storage media we’ll need, far more than capacity. Meanwhile, in other news the thesis progresses, albeit slower than I may like. One of the most disheartening aspects of the thesis is seeing the flaws in your data, especially when you weren’t aware of them before hand. It is an unfortunate element of the PhD, that by the time you’ve learnt one of its lessons, it is often too late to do anything about it. Despite promising myself that I’m never doing another — A promise distinctly easier to keep than most — part of me still feels that if I did do it again, I could do a vastly better job. Of course, this ignores all the critical health troubles brought on by the further stress this would impose. As well as the photography, I’ve also been giving consideration to this site. In the past I have bemoaned how the organic evolution of this place has caused a lot of the earlier content to have lost its context. This is becoming increasingly important when I realize that I shall be entering the job market shortly, and while I don’t intend to put my url on my CV, I can’t pretend that an employer wont Google me. When they do, I’d prefer that it is obvious what was written when I was sixteen, and what was written yesterday. Even the name of the website dates back to my early days on the internet; I haven’t gone by Jasp for a long time. There is also the evolution of the web. CSS3 now has decent support in most of the web browsers, and HTML5 is close to being finalized. My online identity is spread across the worlds of flickr, twitter, facebook and several online forums. While pages like my lifestream help bring some of these elements together, I still see room for a greater fusion of these elements under a dynamic, exciting and modern looking website. Unfortunately seeing that this needs to be done is easier than doing it. I’ve tried several abortive designs, and all of them have ended up looking more bland than the current template. As a personal website this place provides no obvious theme to latch on to, and trying to represent ‘myself’ in design terms is challenging for someone who isn’t a professional designer. However, I hope to have a new design of this site up within the next few months, possibly with a new domain name to follow shortly. I took several photos as candidates for the first photo of the project. Some images were intended to reflect the death and rebirth of the year, whereas others were attempts at getting photos of interesting subjects, or merely framing a fairly simple subject in an interesting manner. In the end I chose one of the first pictures I took, and one similar to an image already in my collection. 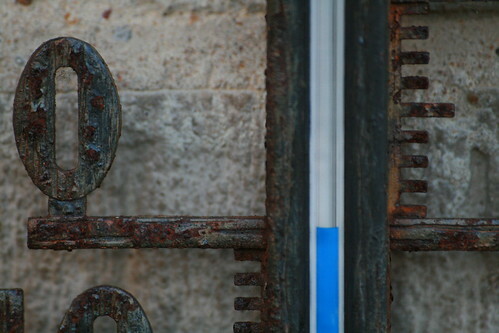 The temperature was pretty much dead on zero, and thus formed a visual indicator of the beginning of the project, and the beginning of the year. Like all good tech geeks I’m counting from zero.